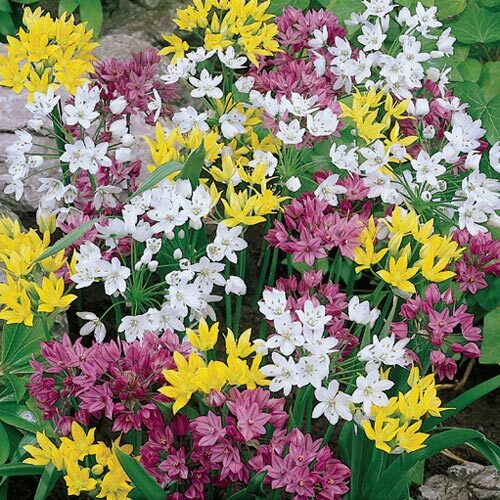 Mountain Bells Mixture | Gurney's Seed & Nursery Co.
Late-spring gardens come alive with color when you plant this easy-grow mixture of alliums. Hundreds of small,2" florets form full flower clusters in a blend of pink, white and yellow. Blooms are fragrant and emit their sweet perfume throughout your borders, cutting gardens and rockeries. Because alliums are not attractive to deer and other garden pests, you'll be blessed with tons of showy flowers. This is a wonderful naturalizing variety, as well, increasing with ease year after year. They tolerate a range of soils and require little to no maintenance in order to grow and thrive in full-sun sites. Reaches heights of 12-14" tall. Hardy in Zones 3-8. Flower FormClusters of 1/2 inch long bells. BloomsLate spring-early summer for 1 - 3 weeks. Growth RateModerate growth rate. Will grow to full height and bloom the first season. PruningAllow the foliage to die back naturally. CommentsWater well after planting. In zones 8 - 9, pre-cool for 8 - 10 weeks. Leave foliage intact until it dies back. Remove blossoms as they fade. Keep soil moist in the growing season. Mix peat moss, compost, or well-rotted/dehydrated cattle manure deeply into the soil. Fragrant blooms.